Starring: Jason Bateman, Rebecca Hall, Joel Edgerton, and more. The Gift, in my opinion, is a special kind of movie. It is a mind game from beginning to end that will have audiences on the edge of their seats in anticipation of the reveal of what is going on. These kinds of thrillers are well received, most of the time, to an audience that welcomes a psychological mind game and gets entertained by them. The Gift IS a gift that keeps on giving on a mental scale. 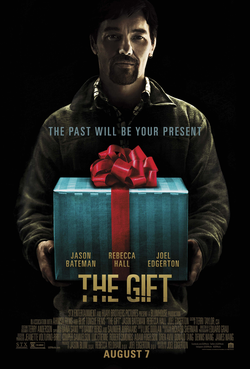 The Gift focuses on Simon and Robyn (Jason Bateman and Rebecca Hall) a couple that is searching for a new home in California at the start of the film. After purchasing a beautiful modern home with a breath-taking scenic view, the couple seems every bit as normal as anyone but soon after a recent visit to a store; that becomes far from reality. This visit to a home-furnishing store results in a run in with an old high school acquaintance, Gordo (Joel Edgerton), whom of which knew Simon when they were younger. At first, Simon does not recognize him until hearing his name which then he plays nice to his face yet begins to speak about how creepy he is as the three part ways. This is a consistent trend throughout the film as Gordo begins to stop over the house periodically throughout the film to complete good deeds around the house for Robyn and he also begins to leave gifts for the two out of good faith but this concerns Simon throughout the movie and he continues to explain to Robyn how Gordo was an odd individual in his younger days and was evened dawned with the nickname of “Gordo the Weirdo”. As the film plays out, the couple begins to question Gordo’s motives and attempt to split ways with him which results in Gordo being passive aggressive with handling the situation as he writes an apology letter which ends in him telling Simon that he was going to let “bygones be bygones” but that would not be the case. This would symbolize that Gordo and Simon have some kind of past together and begins the wild roller coaster ride of which The Gift is from beginning to start. The Gift, if you could not already gather the concept, was wildly entertaining to me. It began ordinary, as if nothing could go wrong and as soon as Gordo was introduced, things went haywire. I was sitting on the edge of my seat in anticipation of what would happen next in this film as the psychological thriller aspect of this movie is so very well done, and without spoilers, everything that would be common and expected in a typical movie is spun completely different in this one. The final motives of why the events of this film go down leaves some audiences stunned, it sure left me stunned, and the overall finale of this film had me impressed enough to be praising this film. I try my best to give you guys open and honest opinions on films and I know this movie has been hit and miss for some audiences but if you want an impressive mental thriller, this movie is a key one for the year.